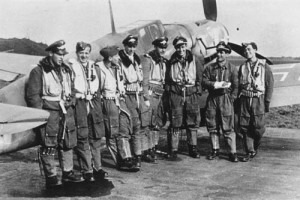 A group of JG 3 pilots. Most of them would not survive the war. Here follows the list of MIA pilots of JG 3. Any question concerning this list is welcomed. If you have the answer to just one of these entries, I would be glad to include your remark and name. Fw. Bauer is burried at Ysselstein Cemetery B1 BH Re.5 Gr.101. Thanks to Richard Schoutissen. He crashed into Romney Marsh at high speed. It is believed he lost control in a high speed dive evading British fighters. Two attempts were made to recover the aircraft and at the second try, Riedel’s remains were recovered (ca.1970). He was buried at the German Cemetery Cannock Chase. Reported KIA in combat with Hurricane IIB of 601 Squadron (P/O Ogilvie). The only location is given as ‘East of Ambleteuse’, but it seems certain that he was shot down into the sea north of Calais. He crashed near Ommen(NL). Aircraft and body recovered between 23 and 26 October 1997. Pilot burried in Ysselstein B1 CB Re.14 Gr.339. Thanks to Geert Beelaert, Harald Rduch, Marcel Hogenhuis and Richard Schoutissen. Uffz. Pusch is burried at Ysselstein Cemetery B1 TD Re.4 Gr.44. Thanks to Richard Schoutissen.